This is a real, bad tattoo three days after the bandage came off. As you can see, it is oriented so that it's most easily read by the owner thereof. 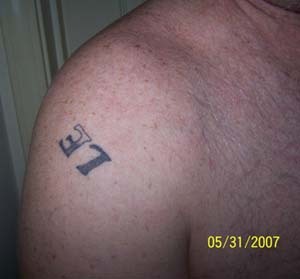 The deal is that the tattooee has trouble remembering right from left, so the tattoo was intended to remind him. All he had to do was look down at his shoulder, and he'd see the word "LEFT." What the tattooee didn't realize till he'd sobered up a bit is that, as you can see, it's on his right shoulder. I like taking ride-alongs with the police, and I think you should too. Below is my report about a ride-along I participated in in Lenexa, Kansas. On my 7 PM to 11 PM ride-along with the police that ended a few hours ago I witnessed and to the tiniest of extents participated in what I regard, in my ever-growing experience with these ride-alongs, as a pretty interesting episode. In an early conversation my cop of eight years' experience told me that in his first four years, in Mississippi, there weren't quite so many rules, you didn't have to take quite so much attitude from bad guys, and maybe sometimes justice got meted out a bit earlier in the stream of due process than what you would expect in, say, Lenexa, Kansas. He agreed that he would rank KCMO PD's real-life, on-the-ground policies as somewhere between Mississippi's and Lenexa's in terms of how much you'd want all your words and actions as a cop recorded for later scrutiny. When we got in the car, one of the first things he did was explain that, unless he told me different, we should assume that all our words in fact were being recorded by microphones, and all our actions in front of the car were being recorded by the little TV camera next to the inside mirror, which they were. Even the radio on his shoulder could be set to record every sound all the time and broadcast it to the car. You see such real-life recordings on television shows like "Cops," and I am here to tell you that compared to all the segments of that show I've seen over the years, the episode I was about to observe would make the top ten, except it wouldn't all fit in the half-hour time slot. Shortly after we had sat down to have a quick bite at a strip-mall restaurant, a call I couldn't read came in to my cop's radio. He stood up abruptly and said to me, "We have to get away from here. I'll tell you why later," and we whooshed out the door and into the car and out a back driveway. It turns out my cop's car had been spotted by an undercover detective who was about to make a drug buy at Tanner's, a bar a few doors down, and they didn't want any black-and-whites in the area, for obvious reasons. We cruised off towards my cop's district. It's by far the smallest in terms of geography, and that's because it's by far the largest in terms of crime. He says it's the "best" of the six districts to patrol. There's one such car per district plus one rover, so seven cops and seven cars in all, plus however many are at the station. On the way he tells me about an incident from a few months before in which their SWAT team decided to break into a well-barricaded drug dealer's house by placing an explosive charge around the door, apparently quite a large charge. Somehow someone forgot to tell my guy, so he blithely pulls up in his car right in front of the house just as the bomb explodes. Although shaken, he is uninjured, and a few seconds later he sees all the other cops rushing to the house. He sets his radio to PA and yells, knowing neighbors might be listening, "Whiskey Tango Foxtrot!?" Get it? The radio tells my cop that someone at a particular address has called 911 and then hung up. He makes a few turns to head off in that direction and we chat a bit more. The radio then says something I can't catch, and all of a sudden my cop hits the lights and siren. The hang-up caller has managed to call back to report an "ongoing domestic dispute with injuries." The dispatcher who received this 911 call tells my cop she heard sounds of violence over the phone. My cop drives about as fast as you can and still stay within a reasonable margin of safety. He hits the straight-aways at full speed, and he takes the corners right up to the point of skidding. He's very good at it, and it's miles of fun for me, of course. He operates a specially loud siren at certain intersections to clear traffic even faster, and he just generally transports us from point A to point B as fast as you can while ground-bound. Of all the cop cars that eventually show up there, we arrive at Point B first, an apartment building in a Section 8 complex called Westminster, and a few onlookers have already gathered, drawn by the sounds from the apartment. My cop is the kind I like on a ride-along. He had already told me that unless he literally dropped me off "several blocks away" from a scene to keep me safe, I could do pretty much anything I wanted. I should point out that by this time I've told him I'm an experienced ride-alonger, and after recounting a few quick stories I convince him to trust my judgment. As another example, when I happened to ask whether he minded my smoking when we were outside the car he said, "Heck, it's not my car. You can smoke inside if you want to." He was kidding, of course, but you get the idea. I liked Officer Stu Roberts, and before the night is over I come to respect not only his judgment but his bravery. Officer Roberts is exactly the sort of police officer I want protecting me and my loved ones. So when he runs and I walk up to the apartment and he pulls his gun and crouches down way off to the side of the door, I decide my best move is to stand right out in the open fifteen feet away. But my cop doesn't notice, or probably care, because at this point he is yelling, "Open the door or I'll kick it in." He is yelling this because of the ruckus and screaming from the apartment. Keep in mind that at this point he has no idea whether there's a maniac with a shotgun behind that door just waiting to kill a cop. His job is to rescue any victims inside, and he's trying really hard to get inside, where he knows violence is taking place, without backup, including me. I see activity behind the side light of the door, the side away from my cop. A woman claws the drape open, then it falls closed. The drape is slashed open again and there's more frantic activity, none of which my cop can see. The next time the drape is swiped open -- by which time my cop has yelled a second time, using the exact same words, "Open the door or I'll kick it in" -- I realize the only person anyone looking through that side light can see is me, not the cop. I shout to him, "There is someone at the door. They think I'm you," and I skittle to my right to get out of sight of the front door. And by doing so I happen to see something my cop can't, which is a teenage girl jumping out a first-floor window on the side of the building. She is bawling and wild-eyed, careering barefoot towards me through a bed of dirt, yelling something at me I can't understand. I yell at my cop, "There's a girl running up to you," and point in her direction. Still, he yells a third time, "Open the door or I'll kick it in." As she approaches I point her towards my cop, and he waits till he sees her. The girl starts yelling, "I'll open the door, I'll open the door." We still hear screaming and other loud noises from inside the apartment, and I realize this had been going on for at least the few minutes it took us to get here. The girl rushes up to the front door, and my cop is looking a bit frantic himself. He's already pretty well occupied with monitoring the frenzy behind the door, and now someone from the house comes racing at him from another direction. But in a few moments it's clear the girl has the key to the door. My cop takes it from her and pushes her behind him. Quickly but warily he unlocks the door and enters. A few moments later he hurriedly escorts an older woman outside and says in a calm voice, "Go stand with that gentleman over there," pointing at me. She approaches me and I see there's blood on the front of her shirt. I learn that the reason for the clawing at the drape was her trying to get the door open and being stopped from doing so by her assailant. She seems remarkably calm, as though this were just one more in a series of such episodes. The assailant, it turns out, is her own child. My cop re-enters the apartment and only a few seconds later runs back out onto the front lawn and says something into his radio. Then he shouts at me, "40-year-old black male, 5 feet 4, bald, white shirt," and points behind me, meaning, "You go that way." (And this is not even the first time a ride-along cop has asked me to circle a building looking for a bad guy on the run.) My cop takes off running in one direction so I take off running in the other. Only then do other cops start to show up, and as they do they jump out of their cars and fan out all over. They are not walking, they're running, and I can hear lots of radio traffic. I enter the first building I see with an open door, walk the length of it through the basement, find no one, and return to the scene of the brawl, where I see the perp has been captured and is handcuffed behind the back in the front lawn of the building. A bit of history on the perp. Crackhead. Convicted forger. Released from prison (not jail, mind you) only two weeks before, and already subject to outstanding arrest warrants. A rap sheet literally longer than two of your arms (I saw it later at the police station). At 5 feet 4, looks to be about 200 pounds and, according to one sergeant, "strong like a bull on crack." This will not be his last reference to cattle. As I get closer I realize the perp I'd been looking for is in fact a female. The person who reported the crime was making little sense, which is probably why my cop got the gender wrong, plus which I think you tend to assume the typical domestic batterer is male. Plus which, as it turns out, the perpetrator is not exactly blessed with an excess of femininely appearance characteristics. She looks like the offspring of a pudgy, bald bulldog and a fire hydrant. Whatever radio messages my cop sent out must have been urgent, because by the time I get back to the scene of the crime there are three more cop cars. And a lot more neighbors scattered all over and around the parking lot. And a few people who know the perp. When I get close enough to hear, she is screaming at her mother, the woman who had reported her to 911, the woman who was sent to stand next to me, calling her every ugly epithet you can think of, including motherf****r (which if you think about would have made a lot more sense if it had been her father). She wasn't screaming sentences, just ugly words mixed in with "I hate you, I hate you." And I mean screaming loud. Throughout the entire episode she almost never spoke, she only screamed. And she almost never stopped. Almost every word that left her mouth was uttered at high volume, and I can guarantee you she is going to be really hoarse in a few hours. But beyond that, and much more significant, she is struggling violently to break free from the cops who are restraining her. Within a few minutes of her capture it becomes apparent that a "greater police presence" is needed, not just because she is so violent but also because of the possibility the ever-growing crowd will turn ugly. Within a few more minutes there will be ten cops there. The last ones to arrive have to park out of sight because the parking lot is already so full of black-and-whites. The woman is supposed to be transported in my cop's car because he is the "primary," meaning we got there first. So he's fighting with her, trying to move her, and so are two other cops. She is screaming randomly at various family members dispersed throughout the crowd. Later more arrive. Apparently someone in the family decided to start a phone tree about this incident, so at various times a lot of people the woman could scream at were present for their share of very personal verbal abuse, all of wrapped in curse words. The woman had an impressively large repertoire of ugly expressions, and she gave all of them a thorough workout not only against various individuals who knew her but, of course, the cops. At one point I learn that the perp's mother -- the one with the bloody shirt who'd been told to stand next to me early on, if you remember -- has told the cops her daughter is HIV positive, what these cops call "the HIV," pronounced to rhyme with "give." My cop has not had a chance yet to put on gloves, because he's been fighting to control the screaming woman from the moment he tracked her down. The other cops eventually end up literally taking turns wrestling with her, just like a tag team. In what turns out to be the last time I speak to him, Stu and I are at the back of his car so he can don some gloves. He says he couldn't get away to glove up, and then he points to cuts on his hands and shakes his head. Now thoroughly gloved and somewhat rested up, Officer Roberts jumps back into the fray. He's the primary, and this is his collar. In your career in a police department, you can probably move up faster, other things being equal, if you identify and locate and arrest serious criminals as opposed to jaywalkers. You want to nab felons, not misdemeanorers. You want to serve up to prosecuting attorneys perps they can't wait to chomp into full-bite. Sometimes it the luck of who gets which radio call, but valor and grit help. The crazed woman is again screaming at Stu and the other cops and at various people she knows, and she is still fighting against being put in the police car. It's been maybe ten minutes at this point, which if you think about it is pretty impressive for a five-foot four-inch woman handcuffed behind her back. At one point someone in the crowd says something and the crazy woman responds by screaming, "I did not bite Nathan. I did not bite Nathan. I would never bite my child, you [bad word], you [new bad word]." Everyone in the crowd the woman yells at yells right back, with equally coarse words and equally hateful sentiments. The woman is making enemies and deepening enmities as fast as she can. Eventually the cops manage to get her into the backseat of my cop car (you'll learn why I call it my car in a few paragraphs), with two people pushing from the feet end and two pulling from the head end. As ferociously as she had been fighting before, it was just as they were inserting her into the car that she ramped it up, becoming a veritable furball of fury. One of the things she screams from time to time is, "I can't go back," meaning she didn't want to go back behind bars. She knows the cops know about those arrest warrants. Within a few seconds of the doors locking closed she begins banging her HIV-infected, crack-addled, fear- and anger-drenched head against the Plexiglass screen that keeps detainees separated from the front seat. She bangs it as often as she can as hard as she can. And I mean she really rares back and takes a full swing, banging it forehead on each time. The violence of these self-destructive motions, and just the sheer noise of it, combined to form a vivid image in my mind of how proud the inventor of Plexiglass would be. But then the woman shifts around and starts banging her head into the left rear window just as ferociously, and only then do the cops decide to remove her. Not for her protection, mind you, but for the car's protection. They didn't mind if she banged her head on the Plexiglass, because they knew she couldn't hurt it, but they didn't want to have to replace a broken window. I will also mention that the backseat of this particular car was well-suited for crazy or grossly unsanitary people, there being nothing more than a molded plastic insert where you'd expect a package shelf and a bench seat and a carpeted floor. It's easy to remove her from my cop's car. They just open a door and step back and wait for her to spring out, which she does almost instantly, following which -- because she forgets she is handcuffed behind her back -- she lands face-first onto the asphalt. Imagine that your hands are tied behind your back and you have a choice of several ways to exit the backseat of a four-door vehicle. How often would you choose the one that lands almost your entire weight of a couple hundred pounds onto your face? The screaming woman is not having a good day. She is rolled into a sitting position on the parking lot and she settles down a bit, no doubt because she has concussed herself. She struggles occasionally, she screams out at various people at random times, but she is calmer than before. The cops' two goals at this point are to maintain control of her and maintain control of the crowd, which by this time numbers maybe thirty, a goodly portion of which seems to have a beef with the screaming woman. Except this one lady named J.J. The crazy woman at one point yells, "J.J., help me, J.J., help me." To my surprise, J.J., who happened to be standing right behind me, answers not with invective or foul language but with a reasoned response delivered in a soothing voice: "There's nothing I can do." The crazy woman rises up against her captors and pleads again, in a piteous, sobbing roar, and J.J. says in a solicitous voice, "Tell me what you want me to do right now." The crazy woman is stumped for a good answer, so she settles for more screamed curses, directed at J.J. and of course the cops who are holding her firm to the ground. As before, they take turns holding onto her and otherwise guarding her. Unbeknownst to her, a paddy wagon has been called, and the cops are just biding time till it arrives. The inside of a paddy wagon is invulnerable everywhere to harm. Another few minutes of screaming, some more occasional struggles, and the paddy wagon pulls up, and that's when it becomes obvious to the woman that she's going to jail after all. She rises up and starts to run, and the cops form on her and try to gain control. She is screaming again, of course, and now she is fighting for all she's worth. The cops try to move her towards the paddy wagon, and she is resisting with all the violence she is capable of, which is considerable. This fight goes on for a remarkably long time just to move her a distance of maybe fifteen feet. When she is within reach of the paddy wagon's rear door, she kicks it up another notch, literally. She is still screaming, and she is writhing and thrashing but now especially kicking. A lot of cops are going to wake up tomorrow with a lot of bruises because of this one woman's ability to kick so violently, which is impressive if you think about it. The cops on this shift of wrestling with her, four of them, keep managing to get most of her inside and, just as they get the door almost shut, she somehow keeps managing to fling part of herself out. At this point she is screaming over and over, "My arm, my arm!" The sergeant pulls out his Taser and points it at her and shouts over and over the exact same words: "I'm going to Tase you." I can see the back of the pistol, a distinctive diamond imprinted on a silver square. She ignores him entirely and continues her tornadic thrashing, and eventually he holsters it. Later it turns out one of the members of the crowd chastised the police for Tasing the woman even though they hadn't, although I can't imagine a more likely unarmed candidate. This wild fighting, and the wild screams from the perp, continue for long enough that the cops are playing tag team again. One cop moves in and another one backs away from the crazy woman. She is still screaming and sobbing, the crowd is as impressed as I am at her power to resist such a force, and the cops continue trying to get all of her into the paddy wagon long enough to shut both doors. At one point the sergeant manages to get all the way past the woman so that he's behind her, and he tries pulling her in from the front while his buddies keep trying to push her in from the back. Between the pulling and the pushing and the kicking and the thrashing (and, no doubt, the threat of the HIV), the sergeant backs out altogether to re-group. I have to wonder what was going on in the screaming woman's mind at the time. I mean, did she think to herself, "If I kick just one more time, just one more, they'll all give up and let me go"? If so, she must have been disappointed a hundred times. After another minute of fruitless struggle against the woman, the cops at the pushing end seize a moment and the sergeant leaps back into the wagon to try pulling again, and this time it works. By holding onto her and quickly making his way to the back of the wagon, he manages to escape in time for the doors to be shut on her, at which point he straightens up his uniform and brushes off his pants and says, "I've branded small herds of cattle with less complications, and quicker." That's the last time I see the crazy woman, but not the last time I hear her. The screaming continues, mind you. "I'll kill you! I can't go back! Noooo!" But there's also that same loud, repetitive sound of the woman banging something inside the wagon. I like to think it is her feet, not her head, but the cops don't care and several minutes later my cop, the primary, drives the paddy wagon away with its damaged cargo. This particular arrest will entail an almost unbelievably large amount of paperwork, mostly for Roberts but other police as well. The result, if it's done well, will result in the perp's prosecution for many if not all of the crimes she committed, including resisting arrest and assaulting a police officer. Mission accomplished in about 45 minutes from our arrival on the scene to my cop's departure with the perp therefrom. That was the end of the excitement, followed by a fair bit of milling around. I can pretty much guarantee you this is one of those episodes these cops will rehash for months and remember for years. I figure that since my officer has left, eventually someone will track down the fact I am a copless ride-along, or if not I am prepared to cadge a ride with someone. Instead, that same sergeant walks up to me and says, "We seem to have more vehicles than officers. Would you mind driving your cop car back to the station?" and he hands me the keys, so I do, which is why earlier I called it my car. If the screaming-woman episode is worthy of the TV show Cops, the other story I have to tell you about this night is worthy of World's Dumbest Criminals. A call comes in on the radio of the second cop I ride along with, about an armed robbery in a nearby district. An armed robbery, needless to say, is a big deal for all concerned. The masked gunman is described as "Male, six feet, unknown race, white sleeveless shirt, black pants." We hie off in that direction. Another radio message, and this time we learn the guy we're looking for is named Dmitri. My new cop, Sandy Michaels, wonders aloud how anyone managed to get the perp's name, so I do too. A minute later the radio gives us the answer. Although the perp thought ahead well enough to wear a mask, he forgot to cover up the huge tattoo on his arm that read "Dmitri."